Provide comfort for the family of Delton West with a meaningful gesture of sympathy. Delton Wayne “Bird” West, of Leesville, was called to his eternal home on February 4, 2019, in Gonzales, Texas, at the age of 71. He was born October 6, 1947, in Leesville, Texas, to Olvie Leon “Pete” West and L’Clara Sabrina Brister West. He was preceded in death by his parents; his wife, Selma Christine Parks West; and sisters: Ima Jean West, Inez Robinson, and Iva Lea Hodge. He is survived by his children: Dale West and Christan Henderson and husband Joe Jr.; sisters: Illean Mikesh, Irene Burt and husband, Steve Sr., and Inella Bennett; numerous nieces and nephews and other loving family and friends. A Visitation will be held Thursday, February 7th, from 5:00 PM – 8:00 PM at Finch Funeral Chapel in Nixon. The Rev. Michael Cowey will officiate with burial following in the Caraway Cemetery near Leesville, Texas. Memorial contributions may be made to the charity of one’s choice. Arrangements entrusted to Finch Funeral Chapel, LLC, Nixon (830) 582-1521. 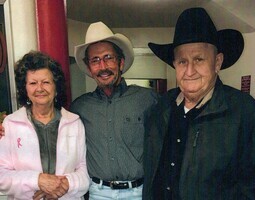 To send flowers in memory of Delton Wayne "Bird" West, please visit our Heartfelt Sympathies Store. We encourage you to share your most beloved memories of Delton here, so that the family and other loved ones can always see it. You can upload cherished photographs, or share your favorite stories, and can even comment on those shared by others.